Now that teen sailor Abby Sunderland is safe and well, the backlash against her voyage — and more importantly, her parents — has begun. But are the Sunderlands really deserving of the title "parents who should be shot"? 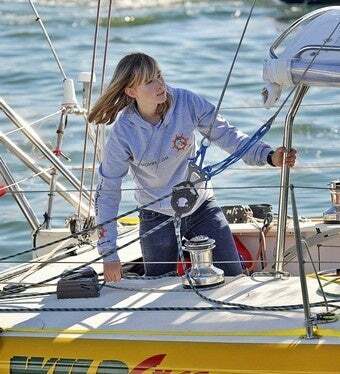 On June 10, 16-year-old sailor Abby Sunderland went missing at sea. A day later, rescue ships located her crippled yacht, which was "damaged but seaworthy" and made contact with Abby. They told her that it would be several days before the nearby French fishing boat reached her wreck, but fortunately Abby was equipped to safely wait out the bad weather. At the end of the ordeal, Abby was completely fine, though her dream to be the youngest person to sail around the globe was temporarily thwarted. However, this short-lived crisis brought her - and her parents - international fame. It also unleashed whole flood of criticism, especially once it was revealed that her father, Laurence Sunderland, had planned on making a reality television show out of Abby's voyage. Once it was revealed that Sunderland had not only equipped Abby with the means to circumnavigate the globe, but also the cameras required to document the journey, internet commenters and reporters alike began voicing their judgment for Laurence's type of reckless, fame-hungry parenting. Sunderland insisted that the reality show, which was to be called "Adventures in Sunderland" and feature all of his seven daredevil children, was not the impetus for Abby's trip. "The wheels in motion for this trip had actually started when Abigal was 13 years old," he said. Though this may be the case, Sunderland had clearly planned to create a television show, and possibly a documentary, from the footage from Abby's boat. Information about the two projects appeared weeks ago on the Magnetic Entertainment website, though it does not appear that the production company ever managed to find network support. However, it seems the reality show deal must have gone sour at some point, because Sunderland is now claiming that Ted Caloroso, a producer at Magnetic Entertainment, wanted Abby to die at sea - all for the sake of "good" television. "He wanted to make it about me being an irresponsible parent and Abigail dying," he told NBC News on Monday. But maybe Sunderland is just trying to spread around the blame a bit - and considering the Daily Beast called for his execution, we can't say we blame him. From the moment it was revealed that Laurence may have tried to sell his children's story for fame or personal gain, he became and instant villain, the worst kind of bad parent. Some of the harshest criticism came from the Daily Beast, where Anna David accused the Sunerlands of using their daughter to cover the monetary losses from her brother Zac's round-the-world sail last year. David also breaks down the costs of Abby's rescue, which apparently totaled $1.1 million. Though she never really elaborates on this suggestion, David also calls the Sunderland "parents who should be shot," and seems somewhat disappointed that the Australian government has chosen not to charge her parents for the costs of Abby's rescue. Further criticism comes from Leonard Pitts Jr., a defender of the "cotton-wool tunnel" at the Miami Herald. Pitts, in response to a quote from Sunderland about our modern tendency to coddle teens, calls the Sunderlands (somewhat unfairly lumping them in with the balloon-boy parents): "Parents narcissistic enough to believe they belonged on television and calculating enough to exploit their own children to get there." He also stresses his belief that there was "no reason" for Abby to undertake her journey. "She was hardly Ferdinand Magellan seeking a western route to the Spice Islands," he remarks. And, like David, Pitts chastises the Sunderlands for costing the Australian government so much wasted time and money. Though Laurence Sunderland's reality television show may seem in bad taste considering the danger Abby faced in the Indian Ocean, it is necessary to point out that there is no evidence that he wanted this to go awry. He insists that he loves his daughter, and wanted to encourage her to try and achieve her dream. While some find it suspicious that her goal was the same as her brother's, as a younger sibling, this makes perfect sense to me. Others have claimed that her father pushed her into sailing, seeing as he is a sailing instructor and all. But even if this is the case, he seems to have instilled a real love for the sport in his teenage daughter. "I still love sailing just as much as the day that I left and I'm definitely going to keep sailing and I hope to sail around the world someday," she told the AP. "It's been a dream or a goal of mine for years. I don't know when or how I will, but I'm pretty sure I will one day sail around the world." Abby's need to defend her dream is one of the more distasteful things to come out of the entire media storm. Though she was once celebrated as a brave, trailblazing teen, now her choices have come under fire, all in the guise of critiquing the reality television industry and the fame-lust it spawns. I am not arguing that the Sunderlands should be immune to criticism, just that it seems somewhat of a shame that Abby has to defend both her parents and her voyage. Yes, the rescue efforts ended up being expensive, but at this point, bemoaning the cost of saving a life seems in very bad taste. In calculating the cost of saving her life, David has placed the blame not only on the Sunderland parents, but also on Abby. To me, the bright line in these situations is the age of 16. It's taken us a century of trial and error to settle on that boundary in terms of driving (a.k.a., the ability to deal death to oneself and others), and it seems an apt guideline for these sorts of adventures as well. Word to the Dutch: That's guideline, not law. And while I question the wisdom of a 13-year-old going up a Himalayan peak or sailing solo, I can't fault the impulse behind it. I applaud it. I'm not about to rope up with my 11-year-old daughter on K2, or even Mt. Rainier. That's not who she is. And if it were, she'd still be too young. But the brave parenting of the Sunderlands and the Romeros forces me to reconsider the constraints I put on my kids. It helps me lead my son and daughter to the edge of the woods and tell them, go farther now. On your own. Similarly, we shouldn't let worrying about the state of kids today and the proliferation of stage parents overshadow the fact that Abby and Zac (and the 13-year-old climber) are doing something courageous. Abby did not set out to waste $1.1 million - she went onto the water with a love of sailing and a desire to achieve something meaningful. Was she Magellan? Maybe not. But she her bravery is still amazing and should be praised, not discouraged.